Although it has a population of about 1 million (small for Chinese standards), Yangzhou packs plenty of punch for its size. The city is more than 2,500 years old and was founded during the Spring and Autumn Period (770-476 BC) originally as part of a defense system. However, since it is on the Yangtze River, it has since become a large hub. Emperor Yangdi of the Sui Dynasty (581-618) once visited his female lovers here, rulers of the Song Dynasty (960-1279) constructed their temporary palaces in Yangzhou, and the city was a favorite escape for the emperors of the Qing Dynasty. Although no longer a center for trading items such as silk, rice, and silk as it was during the ages of Marco Polo in the 13th century, Yangzhou continues to be a favorite for many people for its rich heritage alongside modern conveniences. Artists and writers have praised the city for many centuries, a love that can still be found in many ancient texts. Yangzhou has a humid climate and its average annual temperature is 15 degrees Celsius. The middle of summer is warm at about 27.6 degrees Celsius while winters are cold, in January about 1.5 degrees Celsius. Summer is also the rainy season with about 45% of the year’s precipitation falling during this time; mid-June to July is known as the “plum rain season.” This is because the nearby plum farms come alive during the heavy rains of this climate chapter. The nearest airport is in Nanjing, about 37 miles southwest of Yangzhou. There you can find buses that run to the city, or various private transportation options. The train that goes through Yangzhou is part of the Nanjing-Nantong line with about 5 trains departing daily on this route. There are also some fast trains that continue on to destinations such as Shanghai, Beijing, and Guangzhou. Frequent buses are available between Yangzhou and hubs such as Nanjing, Shanghai, Suzhou, and beyond. If traveling between Shanghai or Suzhou to Yangzhou, you will journey across the 3,740 meter long Jiangyin Changjiao Daqiao bridge which is the longest over the Yangtze River in all of China. City buses run from 6am to 6pm daily. They can take you to the top scenic spots such as Slender West Lake, Ge Garden, and more. Taxis are common and frequent; keep an eye on the meter to avoid being taken advantage of. This large city has hotels of all categories to choose from, with many properties in the downtown or around the major bus stations. Compared to the rest of China, there are not as many huge shopping malls and centers in Yangzhou. Yangzhou Golden Eagle Shopping Center is the most upscale destination with Wanjiafu Department Store, Times Square, and Living City also favorite stops. Yangzhou, Huaiyang, and Zhenjiang food can all be found here. The cuisine is characteristic of the Jiangsu and Zhejiang provinces. There is an emphasis on rich broths, high-quality raw ingredients, and careful preparation in order to maintain the authenticity and freshness of each dish’s components. Huaiyang dishes often include braised, stewed, or roasted meat with famous examples such as stewed pork balls, stewed fish heads, shredded pork in chicken soup, steamed hilsa herring, and stewed pig’s feet standing as local favorites. 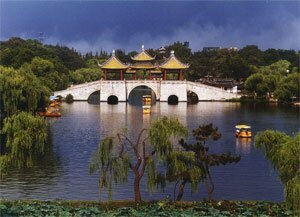 Although not on the main tourist route, Yangzhou is a delight for those who arrive. 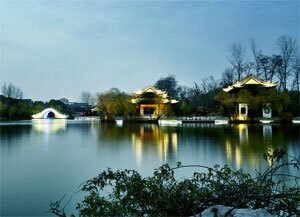 Its most famous location is Slender West Lake which offers stunning scenes of natural beauty and is often compared to West Lake in Huangzhou. Daming Temple is a historical site known also as where a very popular Chinese TV show was filmed. Ge Garden and He Garden are both lovely refuges in traditional Chinese style. Then there is Marco Polo Memorial Hall which recalls the famous Venetian trader’s route through Yangzhou and China and some of his influence. Here is an ideal itinerary for 2 days in Yangzhou. Day 1: Arrive in Yangzhou, visit Ge Garden and the Grand Canal Yangzhou. Day 2: Visit Slender West Lake and Daming Temple, depart Yangzhou in the afternoon or evening.